The following piece was written in June, 2012 as part of my PGCHE studies with the Univeristy of Kent. The theme is Technology in the Academic Environment. The appendices mentioned throughout have been omitted in this version. The aim of the essay is to investigate the numerous instructional considerations required to produce screencasts for use in an exclusively online learning environment. As someone who has used various technologies to produce such learning materials, my aim is to use existing research, my own experience and student feedback to enable me to discover and utilise methods to make considered improvements to my own approach to planning and making screencasts. 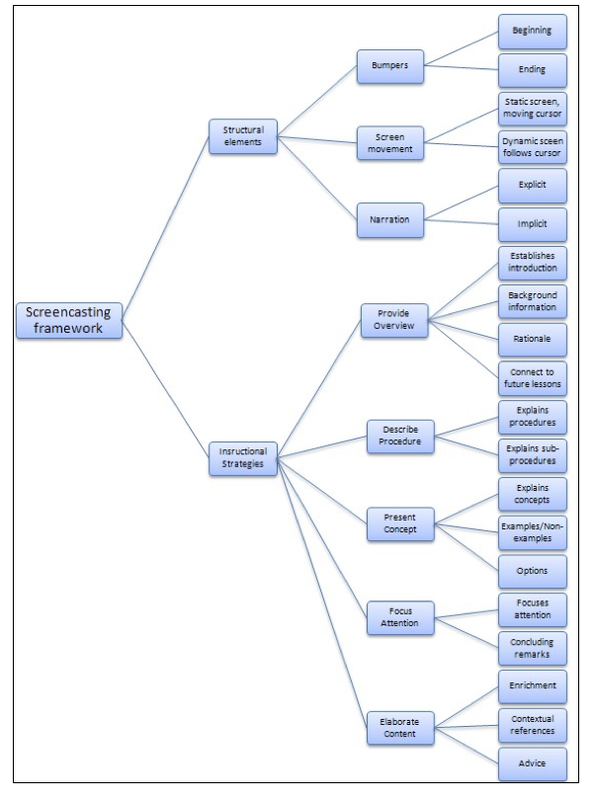 Screencasting is also occasionally referred to as a ‘screen capture’ (JISC, 2010) & (Clarke, 2004). These terms are sometimes used interchangeably along with the term ‘webcasting’. However, (DiMaria-Ghalili, 2005), makes a further distinction between these, describing webcasting as an “instructional technology used to deliver audio and video presentations via the Internet, enabling learners to participate in a live class via a personal computer.” The live participation referred to also relates to webinars and online conferencing and are therefore distinctly different to screencasting. For the purpose of this essay I am using the term screencast to describe the audiovisual recording of reusable screen-based software tutorials or demonstrations that are then placed into a Content Management System (CMS) for student access. Between October 2007 and September 2009 I began authoring and producing various visual and text-based instructional materials for an exclusively online learning environment, designed for undergraduate students of Graphic Design and Illustration. These instructional materials included screencasts. The company delivering these courses is the Interactive Design Institute (IDI). IDI’s courses are delivered globally via the content management system, Joomla. The University of Hertfordshire validates their courses. In the summer of 2011 I resumed working for IDI and was once again requested to produce a large number of instructional materials, many of which took the form of screencasts. The current cohort totals 243 students across levels 4, 5 and 6. Due to the frequent updates to design software such a Adobe’s Creative Suite—which is the design industry’s standard software—and in response to tutor and student needs made every semester via feedback sheets, these materials require regular revisions. As such, it is my intention to make the focus of this essay a means of identifying new, alternative and improved processes to the planning and production of screencasts and in turn improve my approaches to making screencasts. The screencasts are designed primarily for the 150 Level 4 graphic design and illustration students for whom it is specifically expected that they will be able to “demonstrate a knowledge of the underlying concepts and principles associated with their area(s) of study”, and to develop a “sound knowledge of the basic concepts of a subject.” (QAA, 2008) As such, the instructional content of the screencasts is used to demonstrate design software techniques to the largely uninitiated student designer. These short demonstrations provide the requisite technical skills required to complete each practical element within a module and design brief, giving the student designer the foundational scaffold to progress throughout the given modules. The student is then able to watch these as many times as they need and these ‘movies’ can be paused at any point, thus giving the student ample time to watch and perform each step of the activity that is being demonstrated. IDI’s online learning environment is essentially a lecture-less one. There are no formal lectures or face-to-face tutorials. Instead the students have access to a large body of structured instructional materials and a tutor (per module) who can be contacted online at any time. On assessing IDI’s instructional needs, it certainly appears that there is little in the way of effective alternatives to screencasts for teaching these essential skills to online design students. Apart from using text and image heavy documents, the screencast is arguably the most effective and succinct form of the demonstration that I could give that closely mimics what I do in face-to-face environment. For the practical activities required for graphic design, this appears to be the most logical, well received and most requested method of instruction for my online students. One alternative might be the webinar or online conference, but these could be problematic in terms of organizing both technically and in terms of getting tutors and globally spread students to come together at one convenient time. However, this activity could potentially be recorded and it too used as a screencast. As well as arguably having to use them, many of my students respond positively to screencasts (see survey appendix A), this is largely because they are able to repeatedly replay the demonstration and pause it when needed. Also, one only has to scour sites such as Youtube or Vimeo to see the plethora of instructional casts that are growing exponentially, especially for creative software tuition, possibly indicating that screencasting is indeed a logical method of demonstration in the absence of face-to-face tutoring. (Luterbach et al, 2009) might support this notion, stating, “Because screencasting captures desktop activity along with audio commentary, it can be a particularly effective method of explaining computer-based procedures; this can be helpful for distance education situations where students may not have an opportunity to directly observe the instructor compete the task.” I should that I advocate students using opensource tuition to compliment the screencasts provided to further their skills. Millunchick et al (2010) encourage the making of screencasts to explain what he refers to as muddiest points, these are “supplemental screencasts that clarify topics that the students themselves are unclear.” He does this if more than 30% of his students request it. This brings to mind some of the comments raised in the survey (Appendix A) in which students suggested that non-technical screencasts would help support their understanding of some of the more abstract concepts associated with design such as visual semiotics. Within this structure Sugar identifies the following common elements of a screencast and divides these into two categories: structural elements and instructional strategies. The three common structural elements are “bumpers, screen and narration”. In short, ‘bumpers’ are the opening and closing comments within a cast; ‘Screen Movement’ this refers to the way in which the instructional designer leads the viewer’s eye around the screen, and finally ‘narration’. This can be said to be the drawing of the viewer’s attention to a specific part of the screen or software, such as in Figure 2 where in this screencast still for an Adobe InDesign tutorial I have used a device to not only magnify the part of the screen that I want to draw attention to, but this simultaneously darkens the parts of the screen not being discussed. This elaboration is where the instructor encourages learners to “consider other aspects of the process or concept associated with screencast’s subject matter.” An opportunity to make links to other learning and materials. This is something that I intend to develop within my own work. Figure 2. 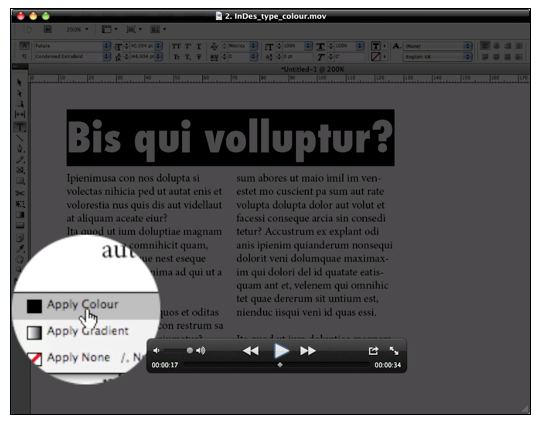 A still from an Adobe InDesign screencast showing a magnified section of the screen—which follows the cursor—and darkened background to help the viewer pull focus on what is a visually important detail of the software that is being discussed. I have always kept my screencasts short for both practical and psychological reasons. The practical being that large file sizes have, in the past, been difficult to produce and on occasion have proved difficult to stream, but also I have taken into consideration how much information a student can cope with in one session of online instruction. Oud, (2009) stresses the importance of considering cognitive load, and to be aware of the limitations of memory when creating multimedia-learning materials. Oud makes the assumption from one particular study that multimedia is more difficult for learners to process, as it places demands on our short term memory and suggests that multimedia is potentially useful in many situations, such as showing processes in action—which is precisely what my screencasts do. Oud suggests keeping the content of the screencast simple. I agree with this and I certainly never make long movies, instead I tend to break each topic down into small manageable stages for the student. For example, if teaching typography, I might look at letter spacing in one cast, line spacing in another, choosing typefaces in another, and so on. This is largely the approach I would take in a face-to-face session; tackling a large design problem by breaking it down into simplified stages and sections. I conducted a small scale, 10 question survey to elicit qualitative feedback (Appendix A) so that I might be able to ascertain how the students both perceive and use the screencasts, and in turn, help identify how I might make future improvements to any of my screencasts. 58% of students viewed all of the videos provided. When asked how they chose which videos to watch, a few of the comments suggested that some of the respondents possessed a prior knowledge of the software, and as such felt that they did not need to watch them. This may be because of prior work experience or because they could be a level 5 or 6 student and had covered most of the videos during level 4. 83% said they watched them more than once. One respondent explained that, “I use the training movies when I need them and when I don’t understand a part I watch again”, and another said that, “I use them if the video content is something new to me, or something that I do not know about. It is especially useful for students who have no prior knowledge of Adobe products.” This is good as this is largely the function of the movies; the student can watch them until they become proficient in a range of specific technical process. Some of the comments—possibly from more experienced students—suggested that the screencasts were quite basic and as such I am now considering compiling a greater repository of screencasts with intermediate and advanced techniques to further challenge students. Students it seems are requesting traditional methods of teaching within the screencast. In light of the previous comments, I am keen to utilise the pooled knowledge of the 12 tutors to gain a greater breadth, scope and delivery of screencasted content. Students made very specific additional software tutorial requests. Some of these could be considered for the repository mentioned earlier. One student suggested that they have access to a far fuller bank of screencasts similar to Lynda.com which is a software training & tutorial video library. Design processes. E.g. Transferring sketch work to digital. Colouring sketch work in a digital environment. – Utilising digital media within mixed media experimentation. Individual needs are not addressed throughout the technology and no quick scans or assessment methods are used by IDI that might inform the instructional design process. I perhaps should add that I have used screencasts as a resource for my face-to-face students and found that these are rarely used or accessed; the students instead preferring to wait until they could ask me for assistance directly. Something that the research does not investigate is accessibility; any screencasts that I put online at college would have to be submitted to the college’s deaf support unit six weeks in advance of it being used in order to provide a full transcript. I have broached this issue with IDI, and although they have no deaf students as yet, I feel that our provision should be ready to include such students. Some of the new screencasts that I have made have limited captions and some have been silent (some student expressed a dislike to the latter). I have made enquiries within the deaf community and have discussed the need for screencasted materials to be captioned, albeit in summarized form. This is something that I will suggest to IDI that we do to improve the accessibility of learning materials. I have begun to do this, as can be seen in the screen shot in figure 3. Figure 3. 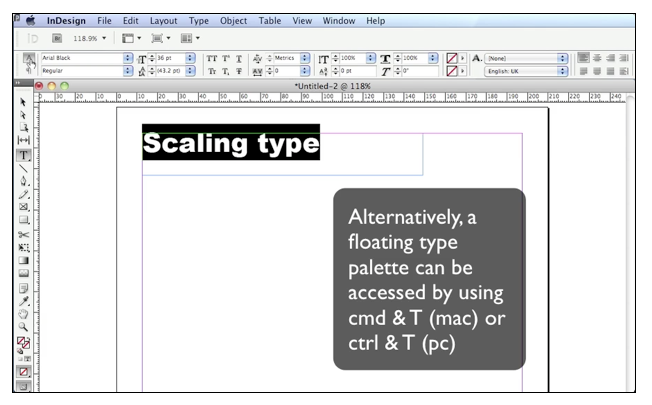 Screencast showing a section of an Adobe InDesign typography tutorial. The onscreen still shows notes that reiterate what is being said in the audio. This can be useful as the student can’t see my keyboard. In short, the research around the topic of screencasting I found to be largely as I expected. Most of the practices discussed were what I would deem common sense approaches to this type of instructional design. However, the structures and checklists for planning will be particularly useful to help ensure content is properly structured and documented. It was the students’ comments that I found to be most revealing and potentially useful, particularly those that leave me in little doubt that in the potential for using screencasts to deliver graphic design can go beyond just technical instruction and perhaps provide a more engaging and richer online learning experience. Brown, A., Luterbach, K. & Sugar, W. (2009). The Current State of Screencast Technology and What is Known About its Instructional Effectiveness. In I. Gibson et al. (Eds. ), Proceedings of Society for Information Technology & Teacher Education International Conference 2009 (pp. 1748-1753). DiMaria-Ghalili R.A, Ostrow L, Rodney K.
Webcasting: a new instructional technology in distance graduate nursing education. J Nurs Educ. 2005 Jan;44(1):11-8. Instructional Designer’s Intentions and Learners’ Perceptions of the Instructional Functions of Visuals in an e-learning Context. The Efficacy of Screencasts to Address the Diverse Academic Needs of Students in a Large Lecture Course. Examining the Anatomy of a Screencast: Uncovering Common Elements and Instructional Strategies. International Review of Research in Open and Distance Learning. Volume 11, Number 3. Lecture Capture: A Guide for Effective Use.